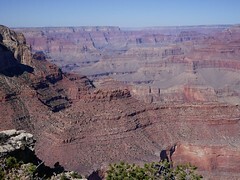 The Grand Canyon can be summed up in just two words: it’s BIG. Seriously. 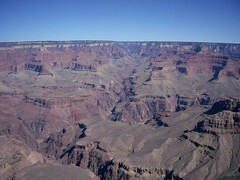 The Canyon is astonishingly large. I had seen it previously from a plane an it didn’t seem that cool. But in person, in real life, it’s sooo big that I fear that words or pictures will never capture it. Never adequately describe it. 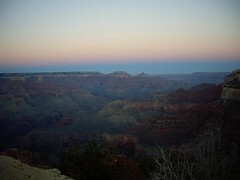 You must go see the canyon that is grand to truely appreciate it. Nevertheless I have tried to capture a small bit of the spectacle in images below. The following two panos have been created using about 20 pics each from a single point and the program Auto Stitch (its free and its awesome). The second pano looks a little weird because it wrapping so far around a single point that the perspective seems odd (since we normally can’t see 250 degrees of a landscape at once – at least without turning our head). These last pics are from the spot I chose to stop and enjoy a stogey. 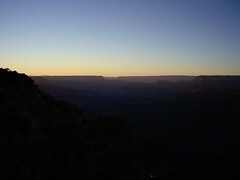 Smoking a cigar and watching the Sun set over the Grand Canyon – it doesn’t get much better than this!